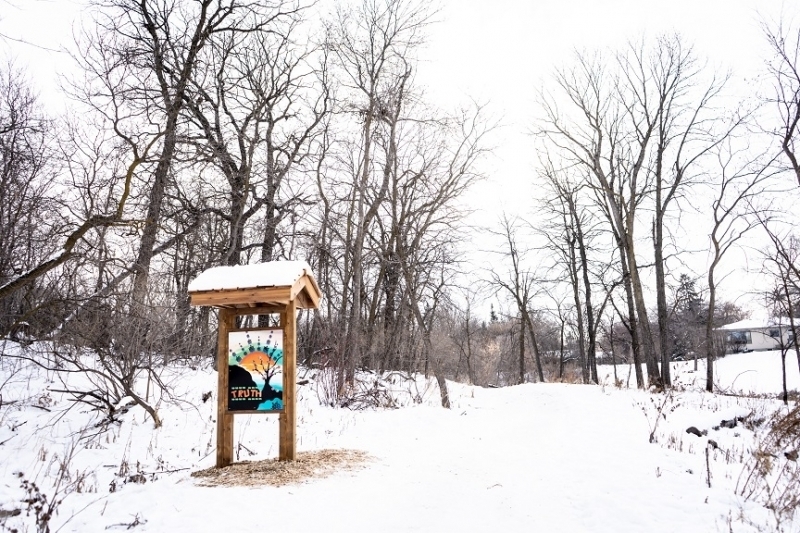 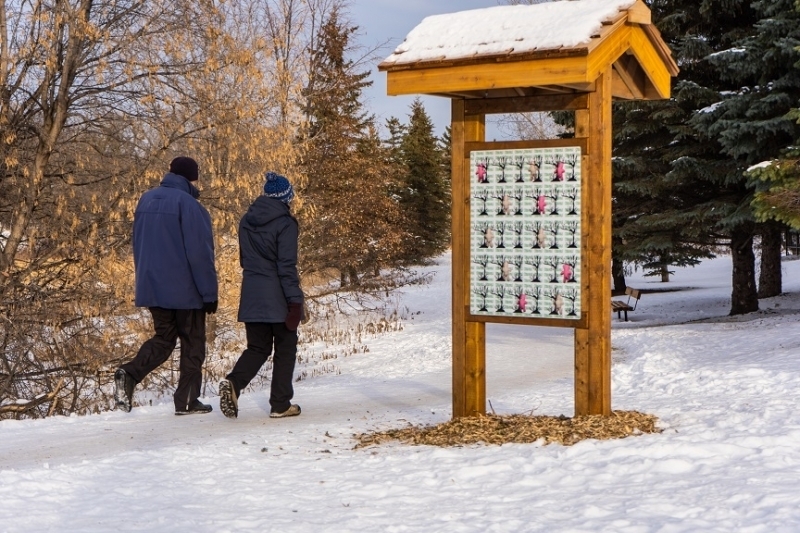 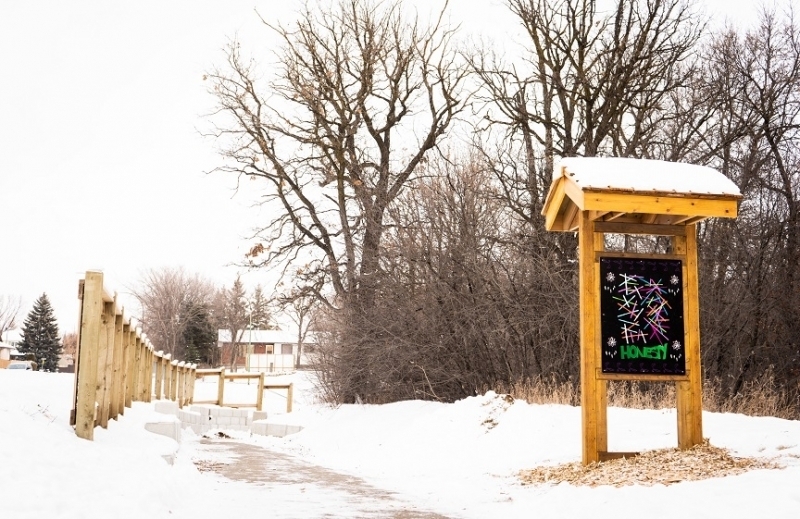 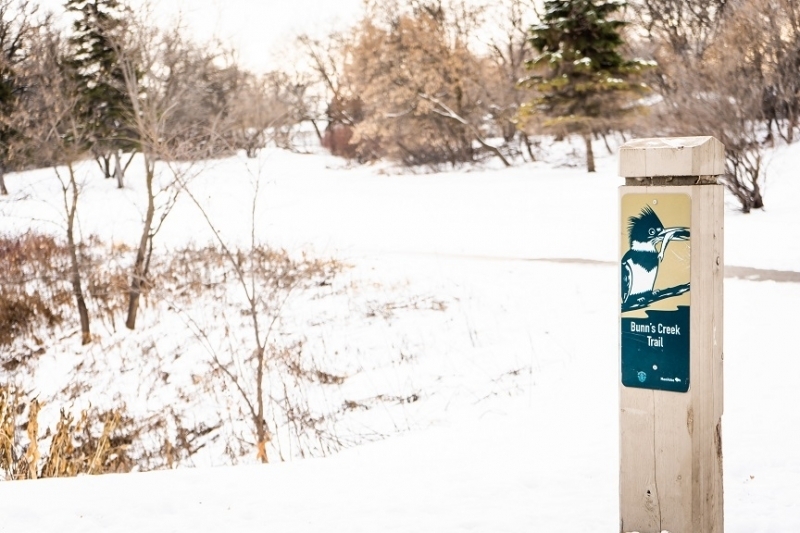 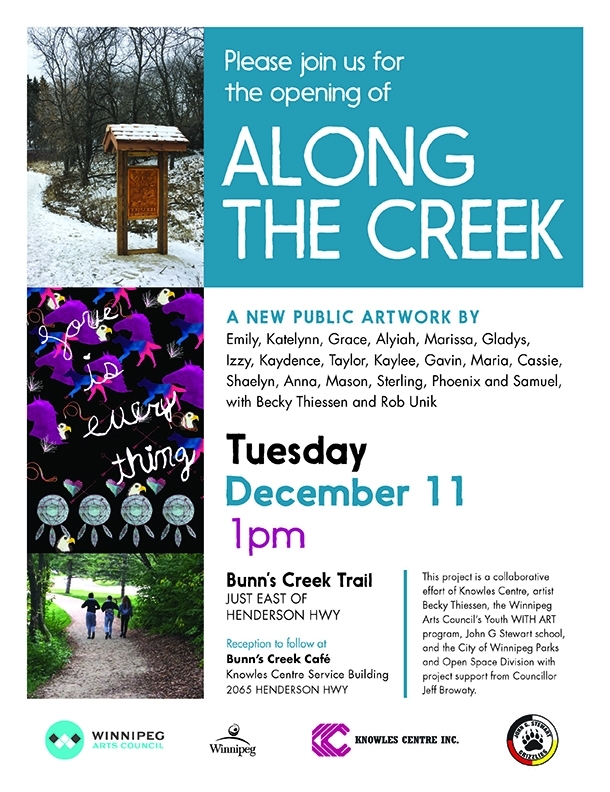 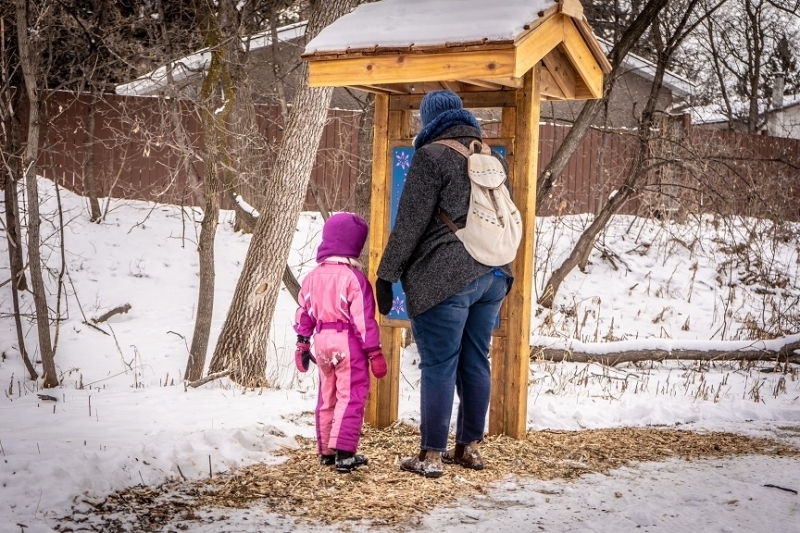 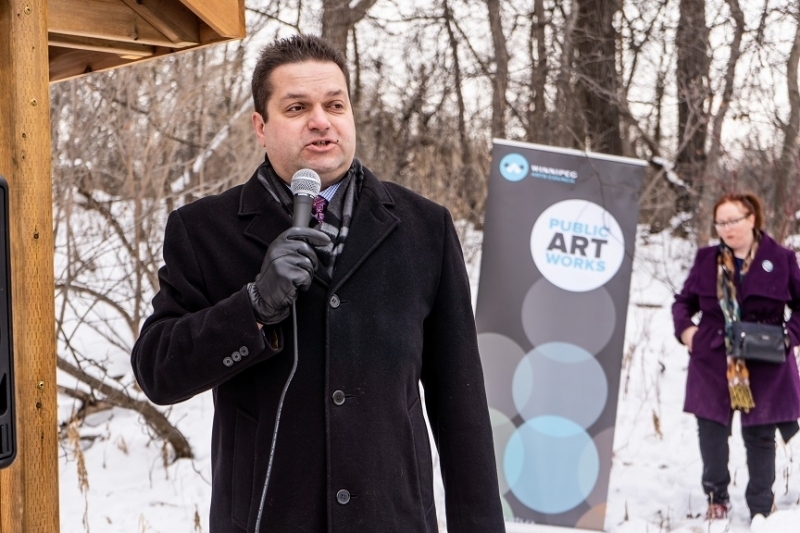 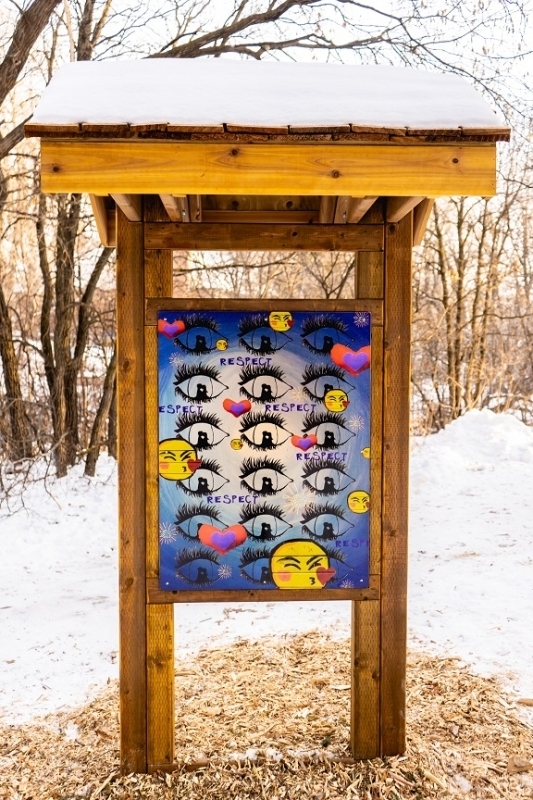 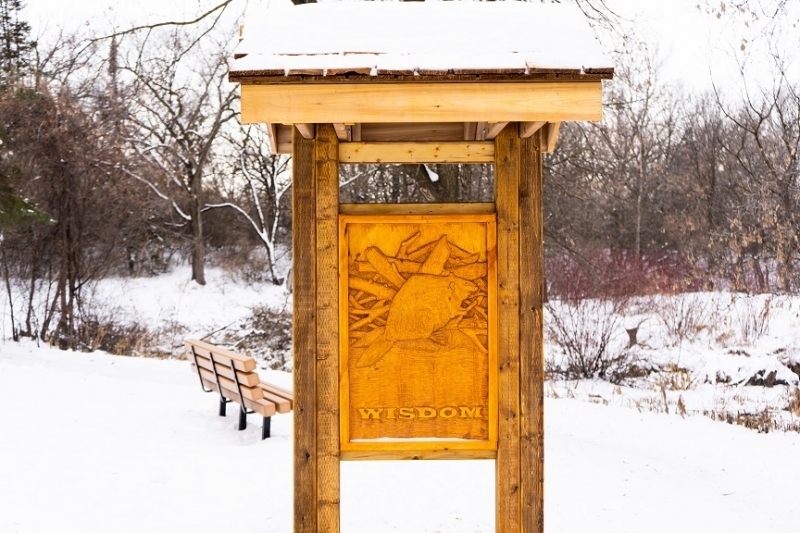 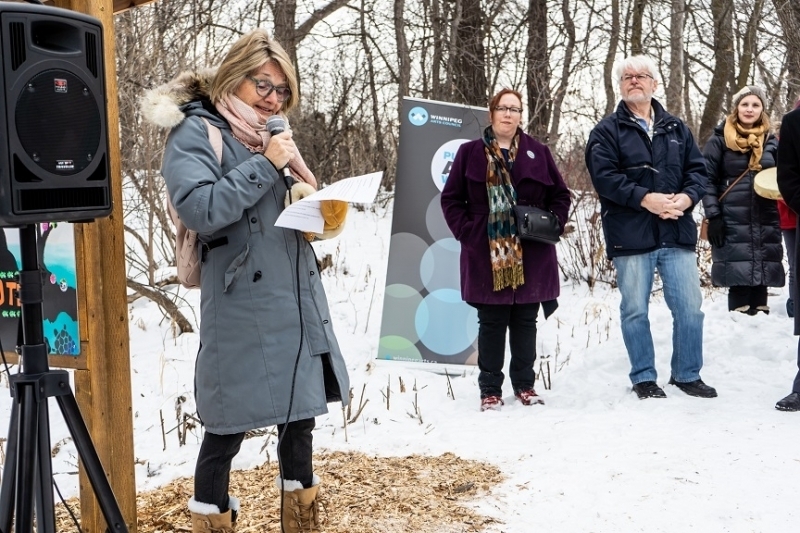 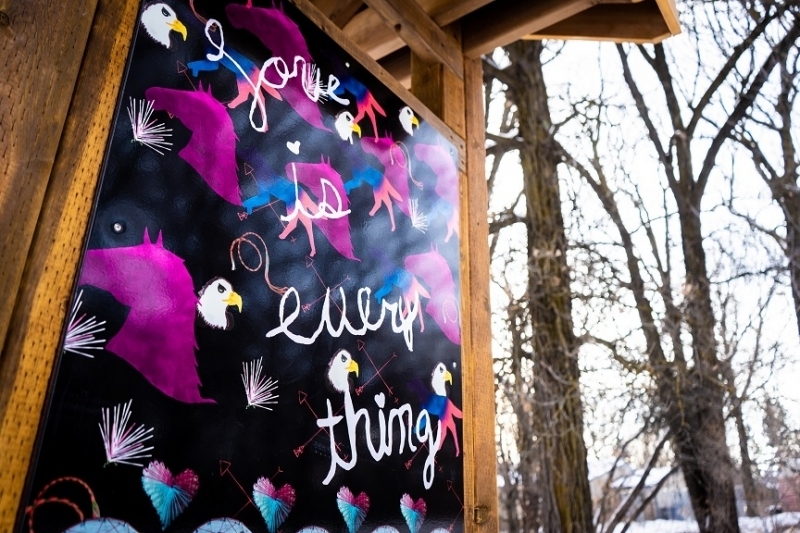 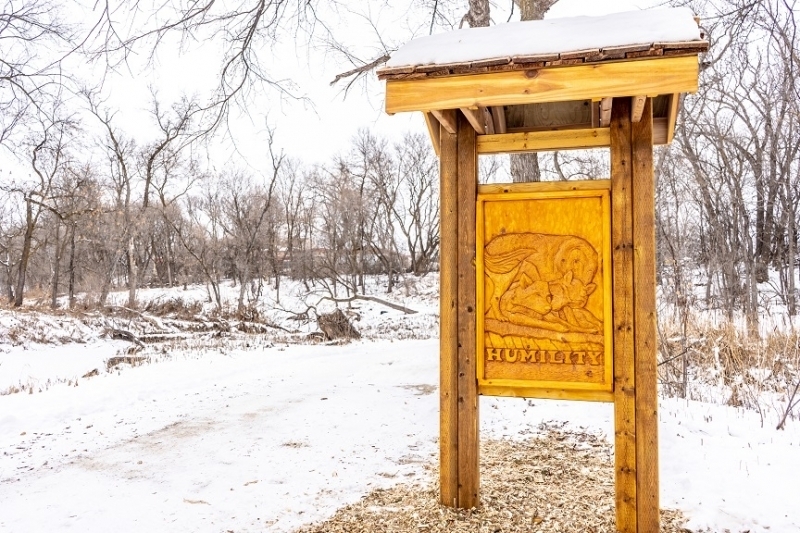 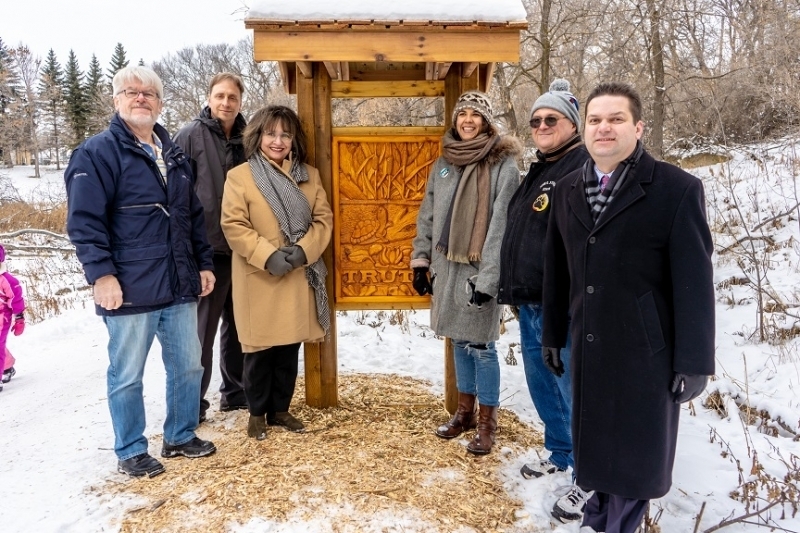 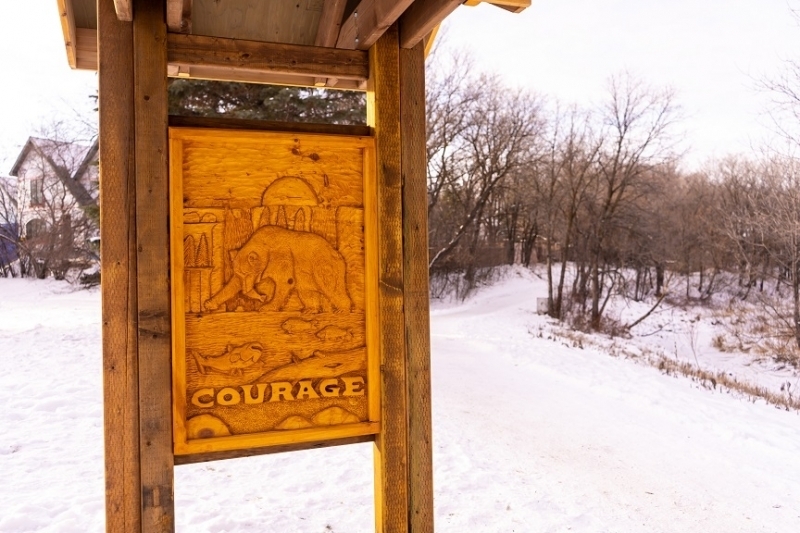 This community public art project, installed along Bunn’s Creek Trail, is a collaborative effort of Knowles Centre, artist Becky Thiessen, the Winnipeg Arts Council, John G Stewart school, and the City of Winnipeg Parks and Open Space Division with project support from Councillor Jeff Browaty. 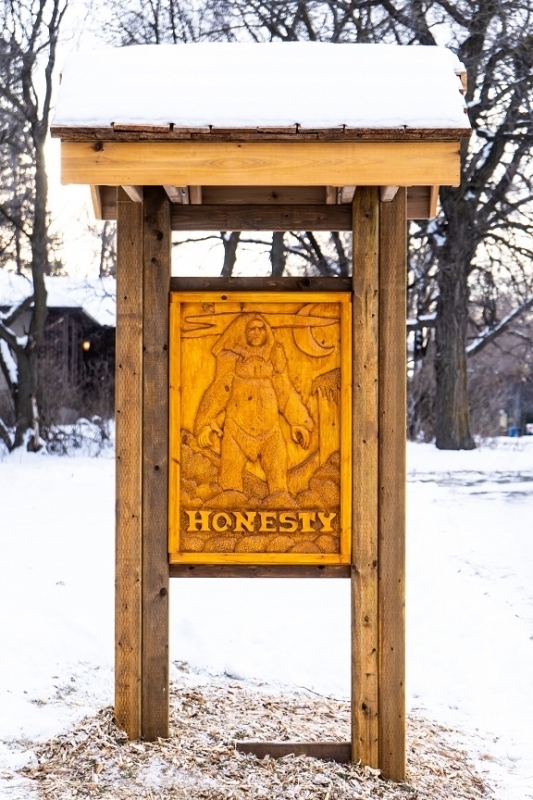 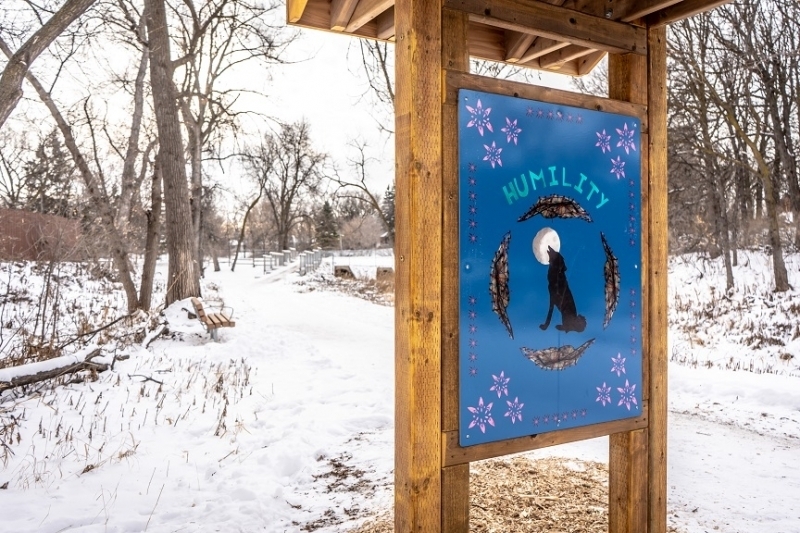 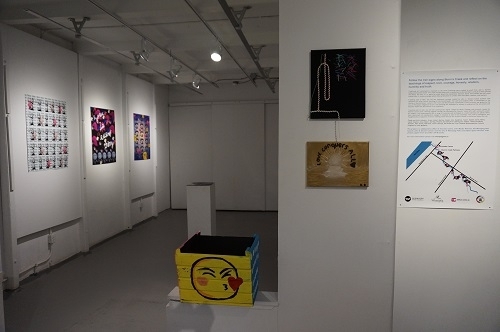 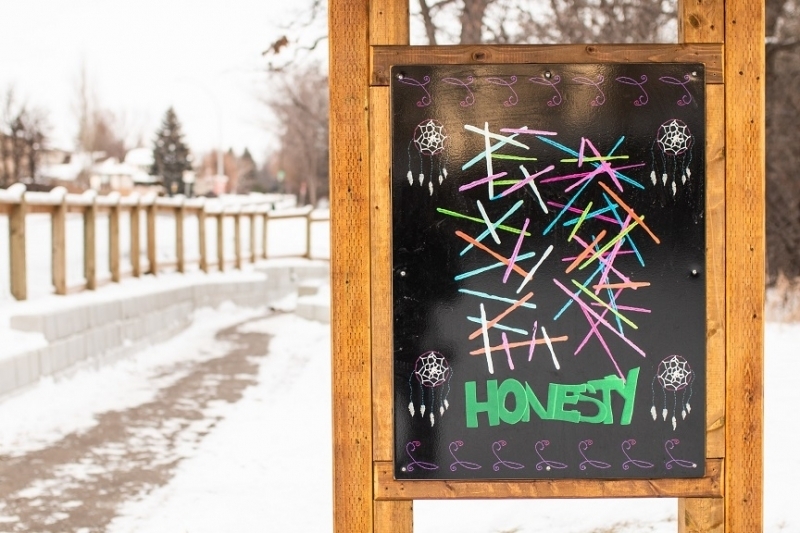 The artwork is a series of trail signs featuring traditional and contemporary responses to the Seven Teachings created by youth who attend the nearby John G. Stewart School and Knowles Centre Programs. 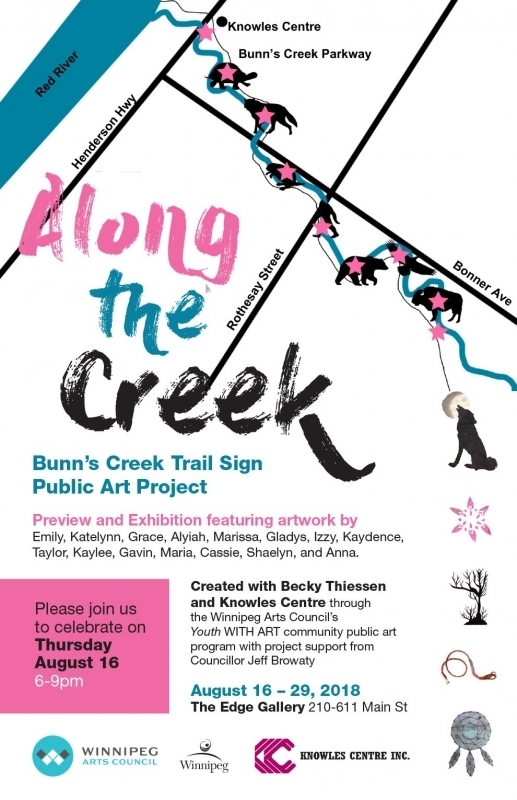 Bunn’s Creek provides the youth with a connection to the land that is critical to their spiritual well-being. 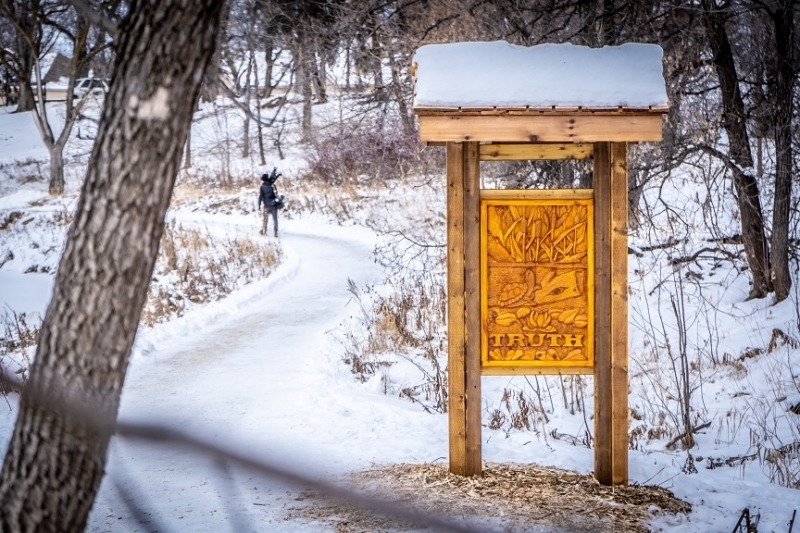 They embrace the opportunity to walk, cycle, and run the trail daily. 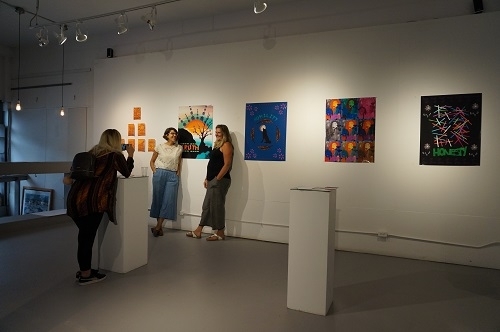 Not only is it a place for study about the vital connections between plants and animals and the world around them, it is also an escape where they can be alone or connect with their peers, mentors, and teachers. 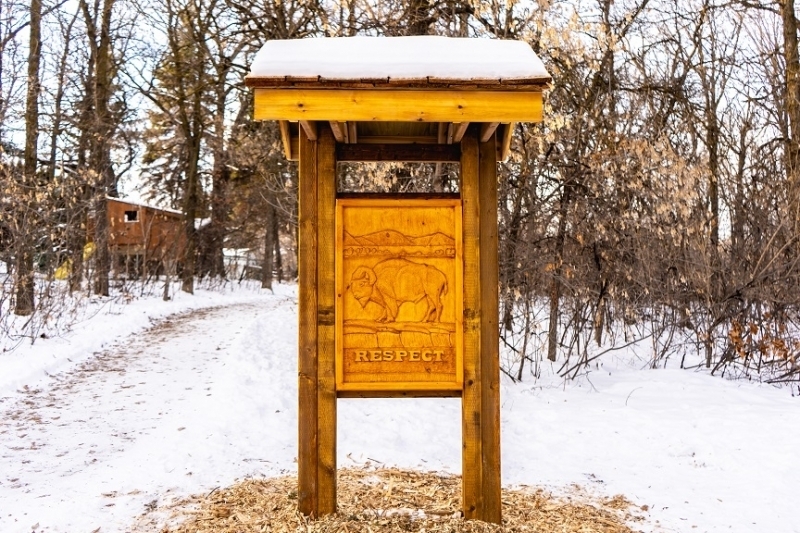 Travelling east to west, you will see traditional wood carvings of animals created by John G. Stewart School students with Educational Assistant Rob Unik. 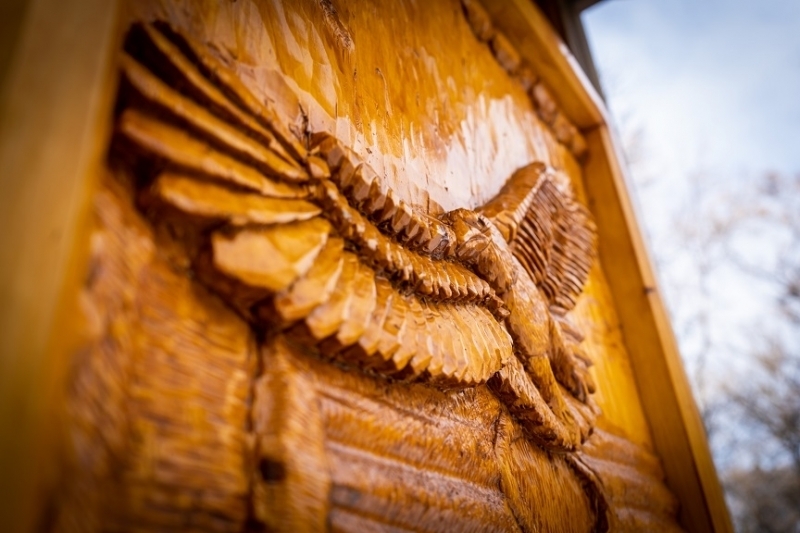 The carvings represent the Seven Sacred Teachings of the Anishinaabe. 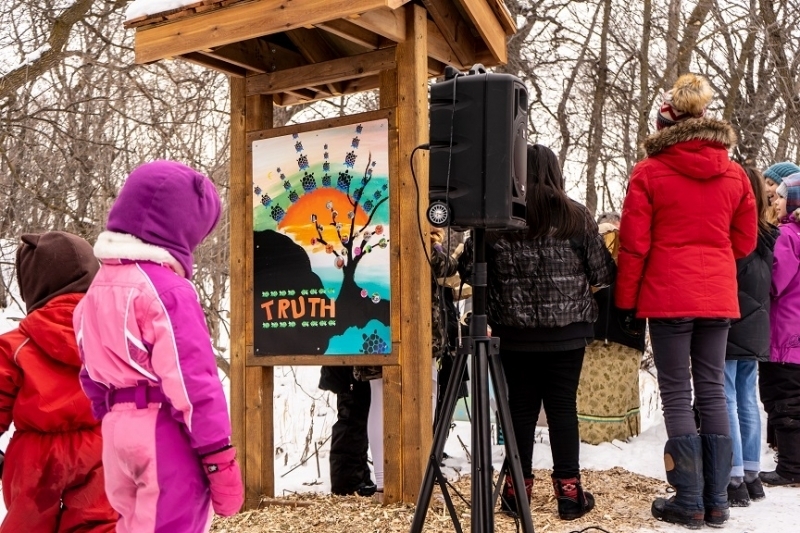 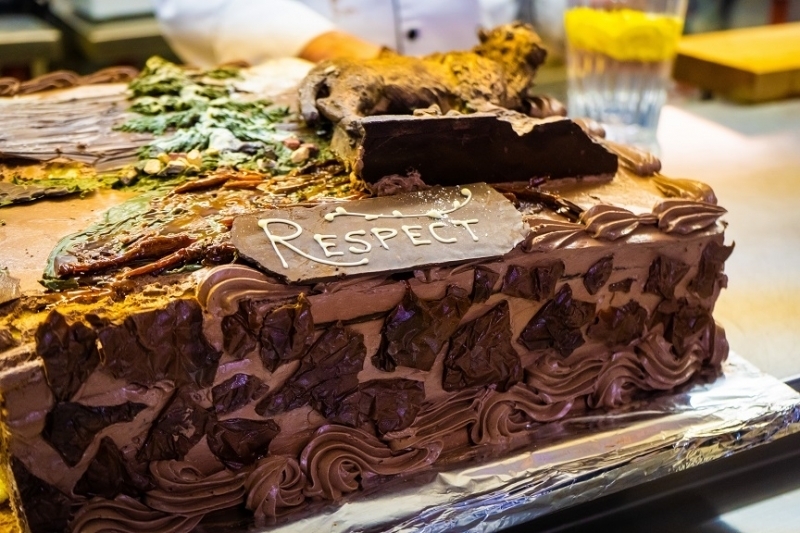 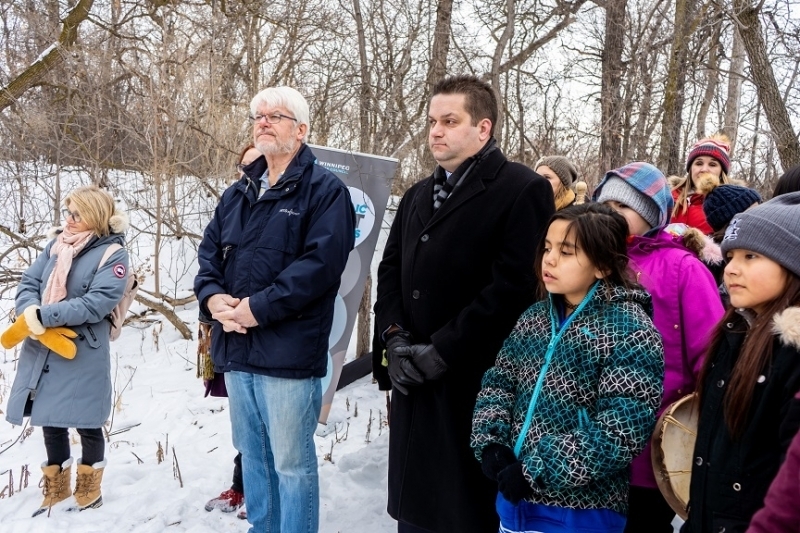 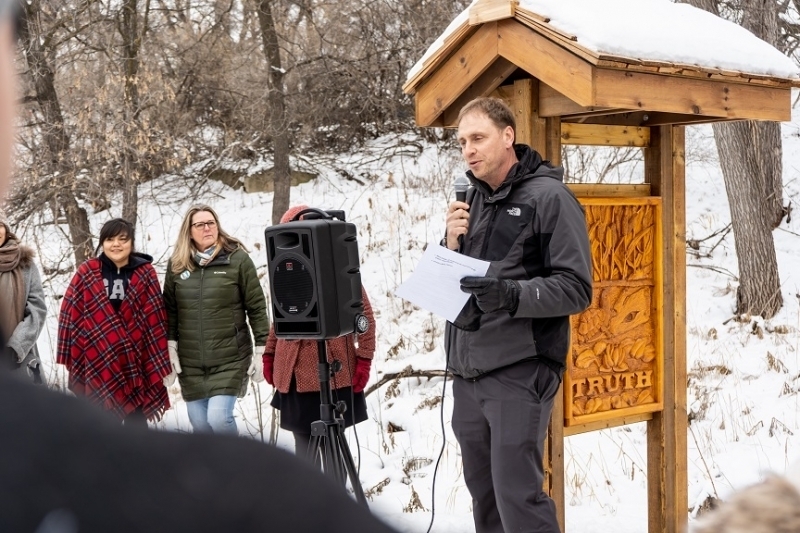 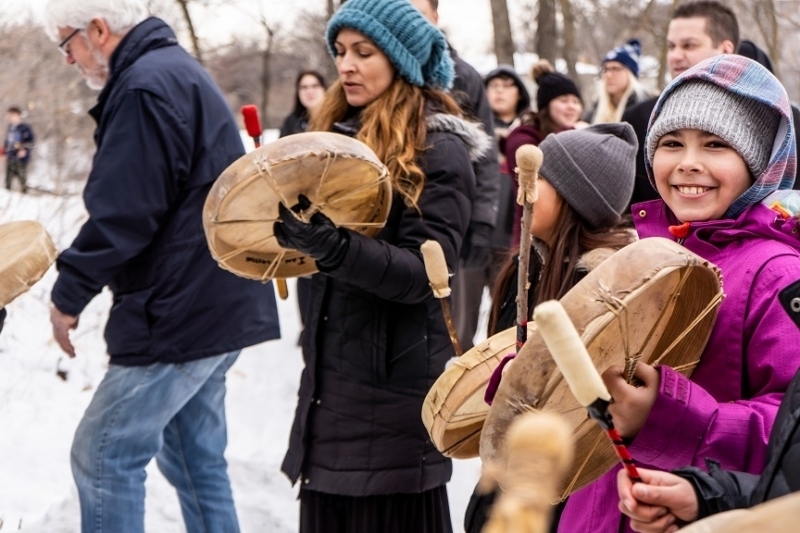 The staff and students share a commitment to the Journey of Reconciliation, rooted in the Truth and Reconciliation Commission’s Calls to Action and guided by the City of Winnipeg’s Indigenous Accord. 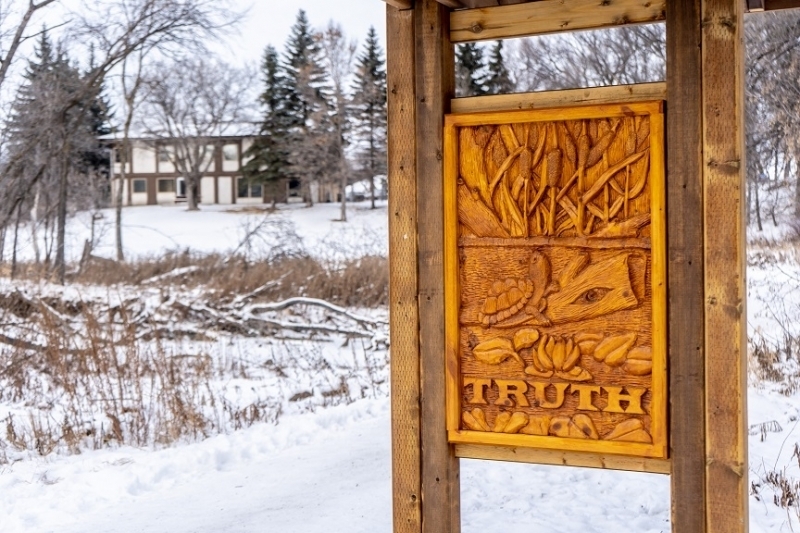 Students are taught that each teaching honours one of the basic virtues that are necessary for a full and healthy life. 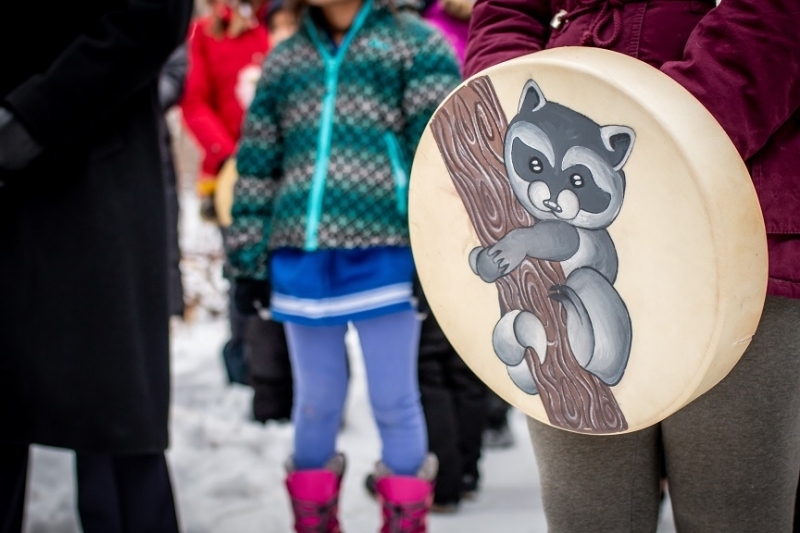 The teachings are embodied by animals to underscore that all actions and decisions impact the land and all of its inhabitants. 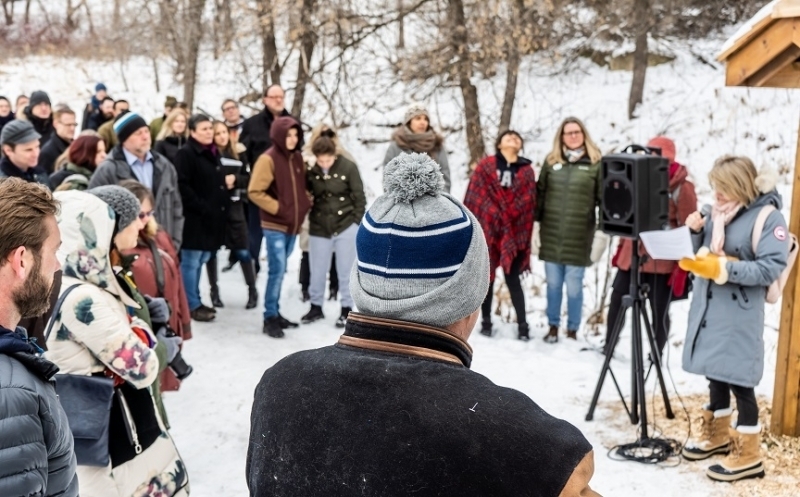 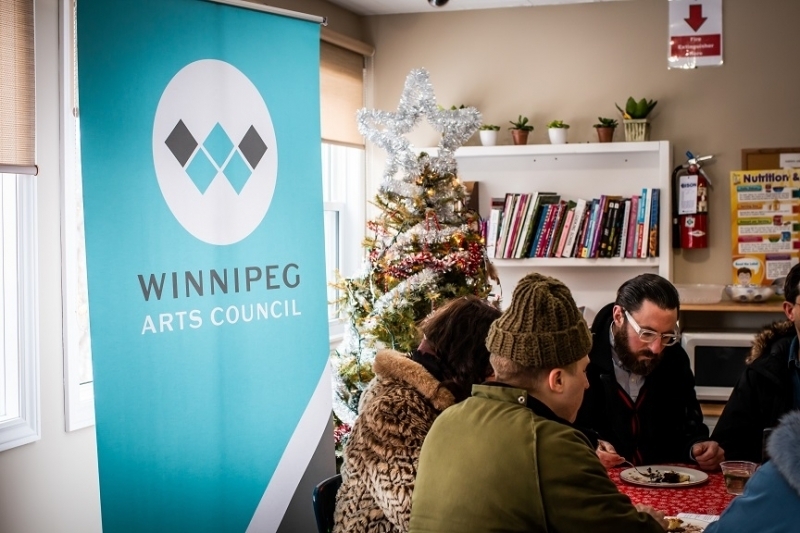 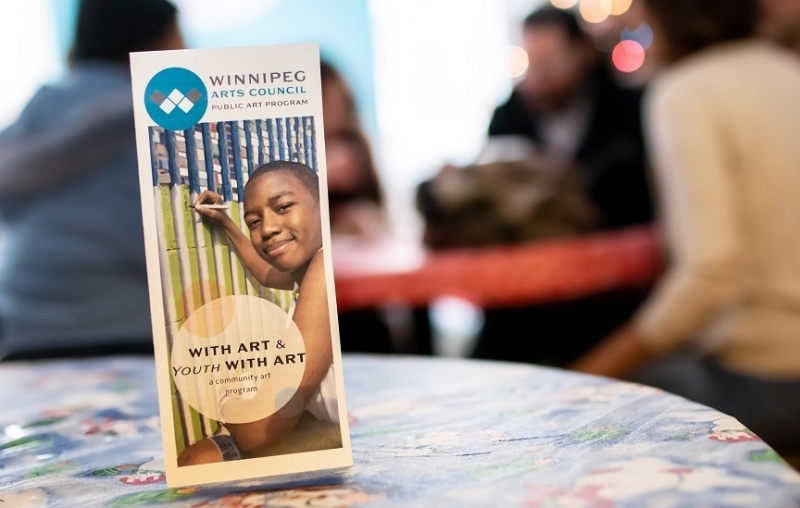 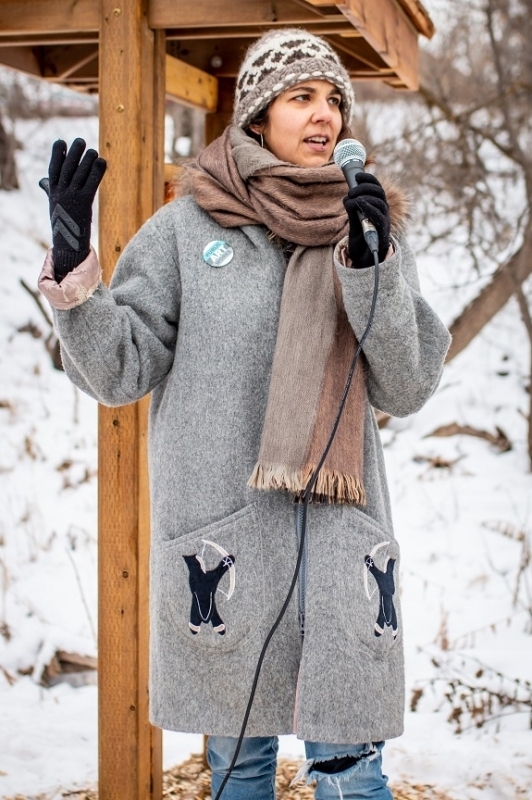 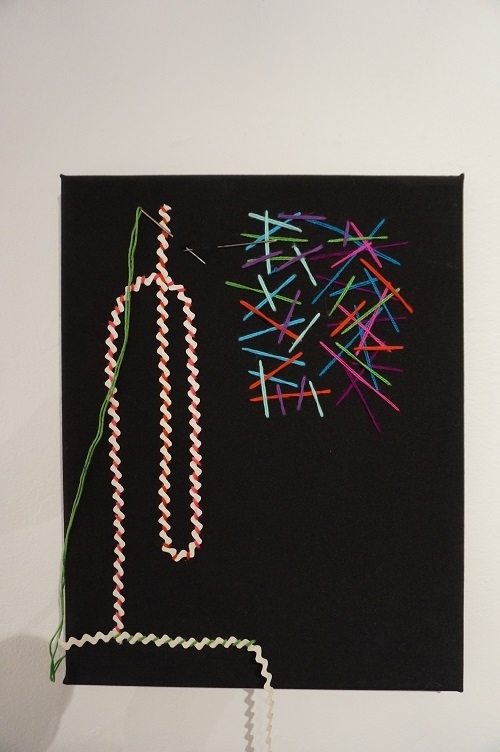 Along the Creek was celebrated with the young artists and their community on December 11, 2018 where artist Becky Thiessen shared a little more about their process, "I would always introduce a new art activity every time I saw the youth. 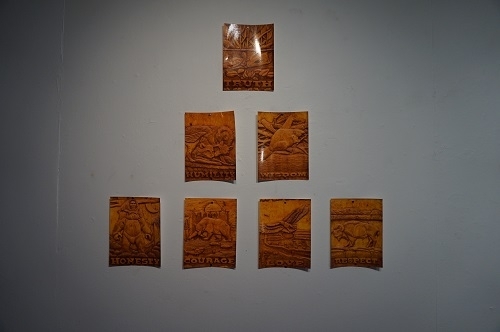 It was up to them to explore the technique and process and to come up with a unique piece. 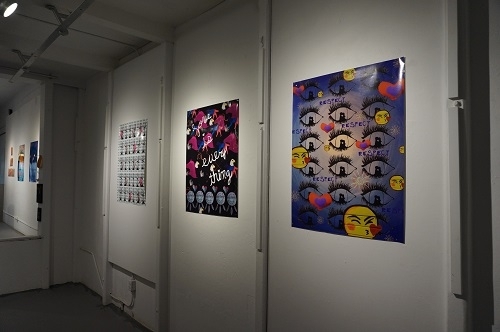 I would photograph (with their permission) everything they made, making digital collages of their work into the various themes. 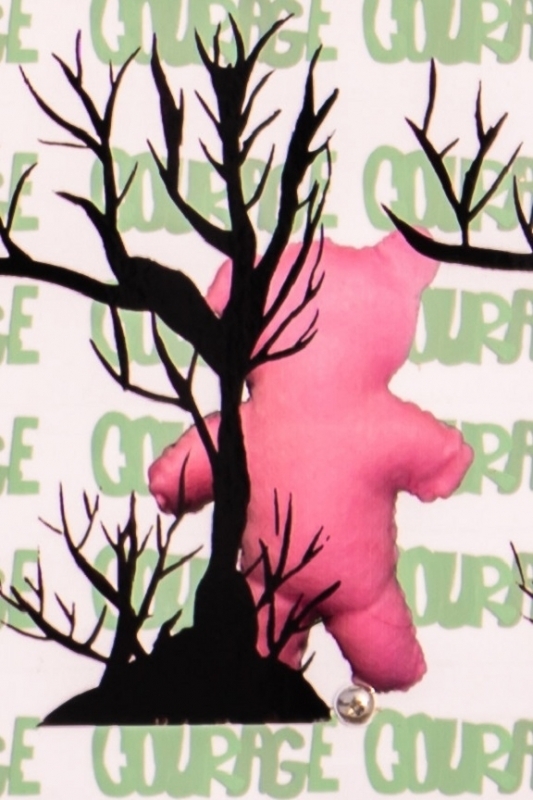 Therefore all the artwork involved in the collages are entirely theirs, I just "mixed" it. 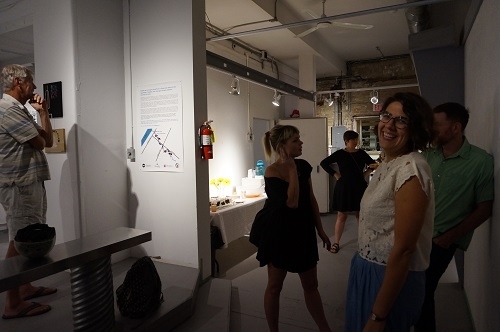 A friend of mine described this process as though I was the "DJ". 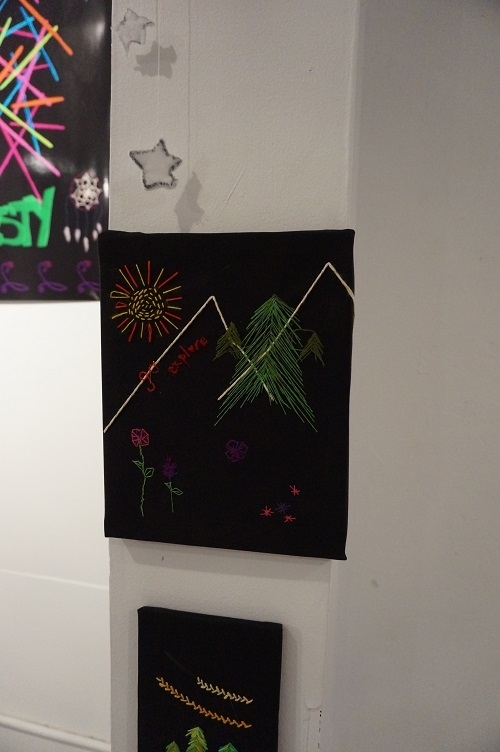 If you look closely at the seven different works you can start picking out the individual pieces of art, from the painted backgrounds to the stitching, threadwork and buttons that seem like they are going to pop off the page!" 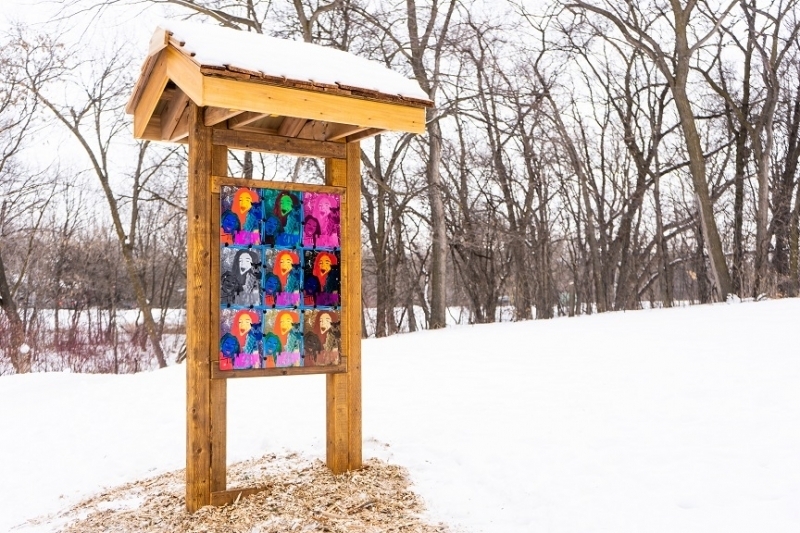 Becky Thiessen's work has ranged from women’s advocacy, family and community outreach and child and youth arts education. 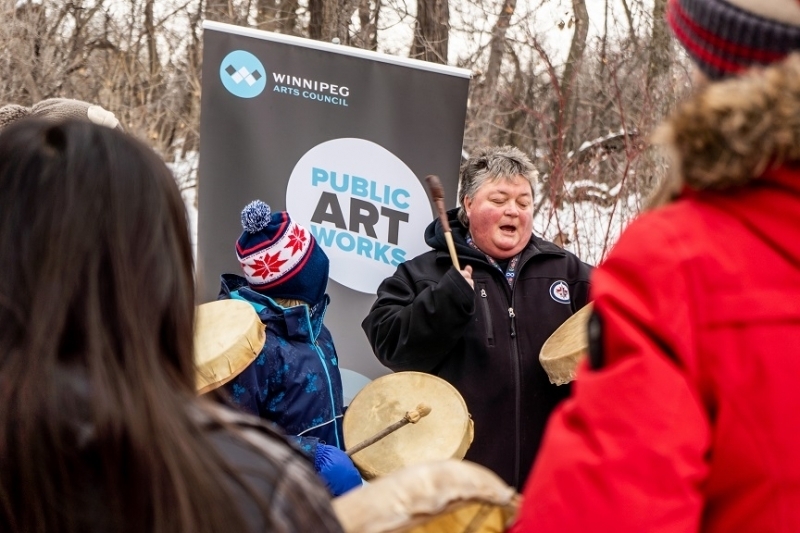 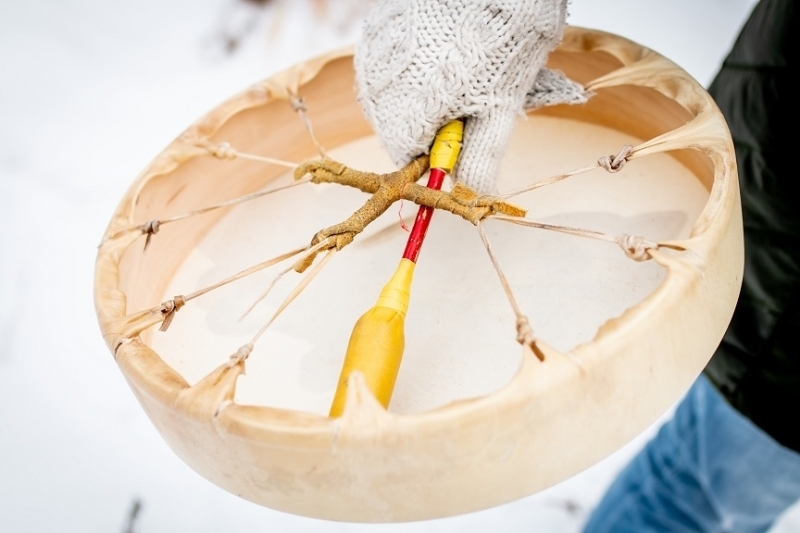 Her work has taken her across Canada to the high Arctic with Statistics Canada and into various rural, coastal, northern and inner city communities as an arts educator with Winnipeg Art Gallery, Art City, Manitoba Arts Council, Winnipeg Arts Council and several other arts and community organizations. 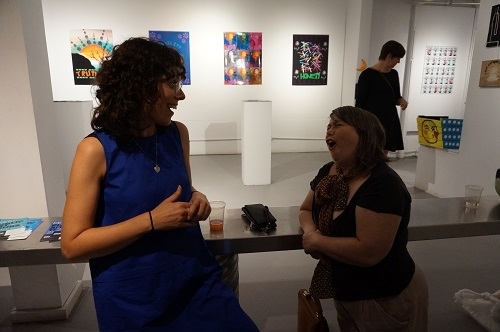 Community and art are her core. 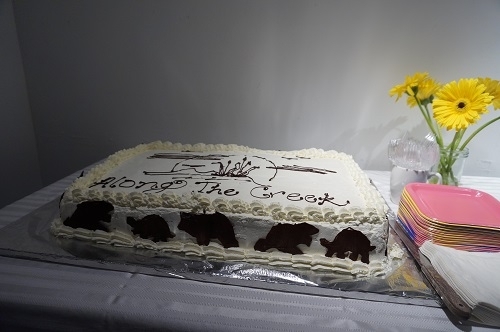 She is now in Nanaimo pursuing her Masters’ of Community Planning. 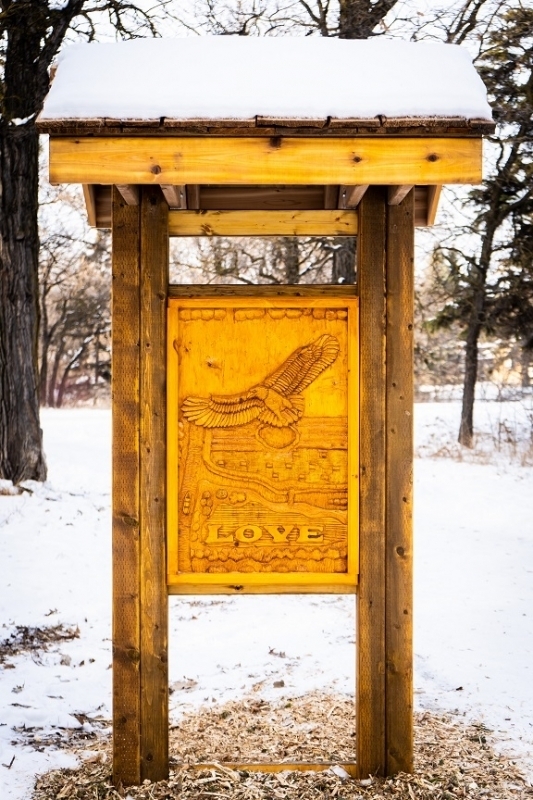 She hopes to encompass all that she has learned to help create and design places that inspire creativity and community. 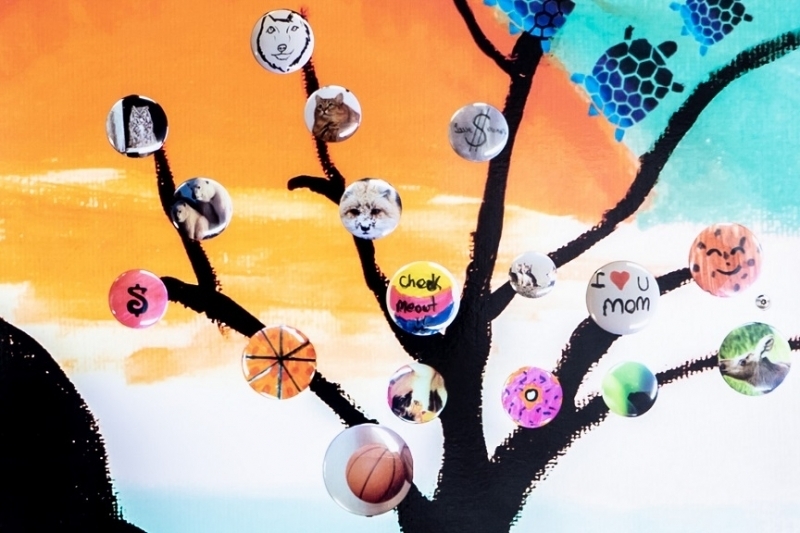 Knowles Centre is a community-based, non-profit social service agency for children, adolescents and young adults facing difficult times in their lives. 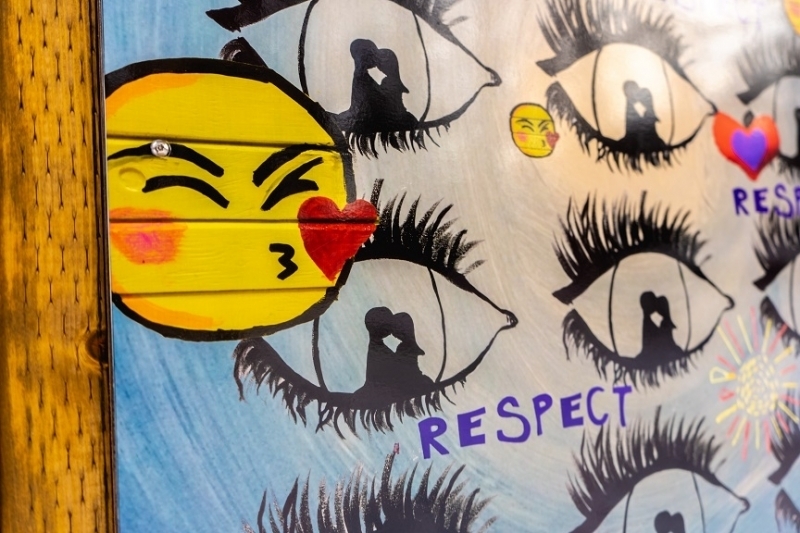 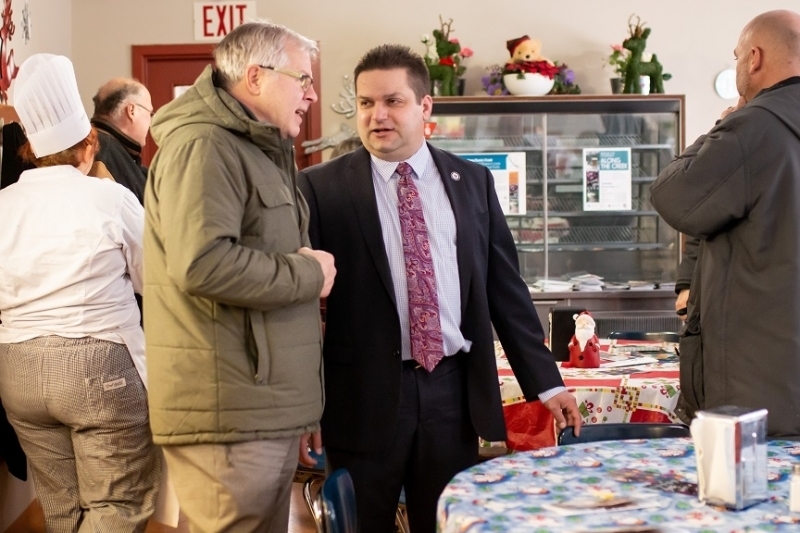 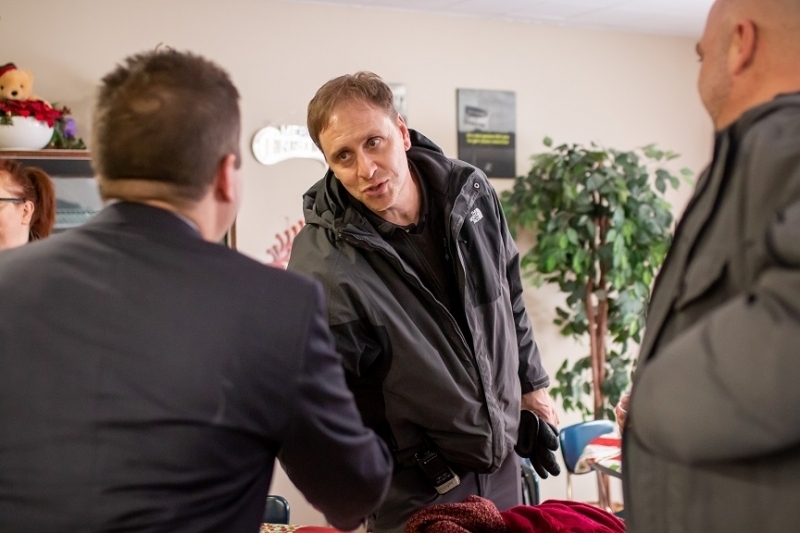 Their mission is to help young people and their families to address past struggles, to develop healthier relationships and ways of life, and to reach their full potential in the future. 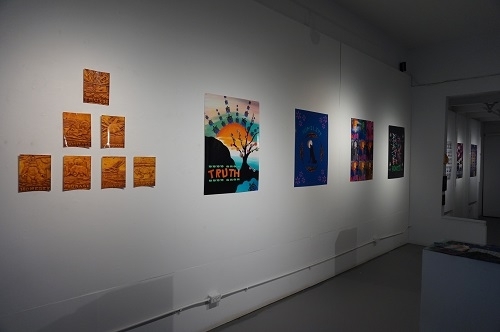 Gallery: Artwork installed and opening celebration. 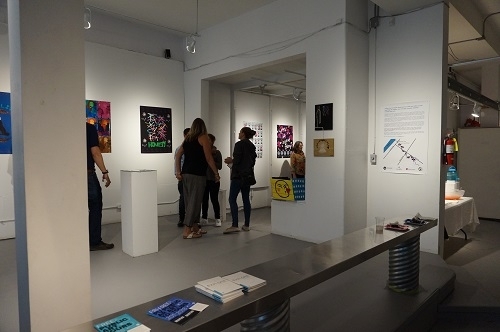 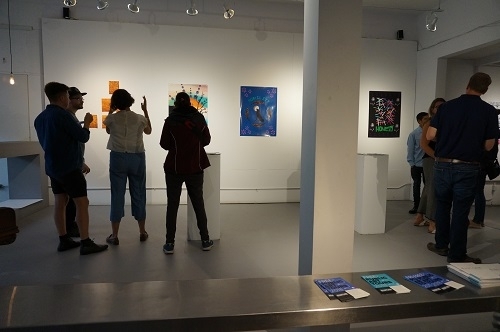 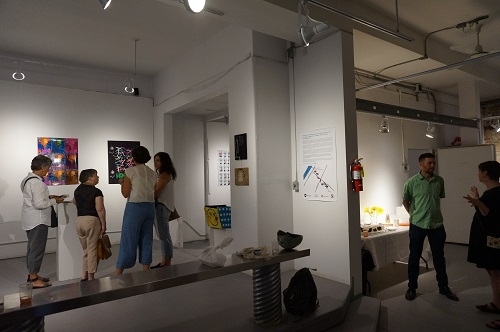 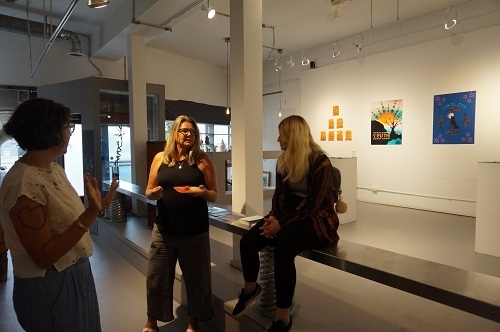 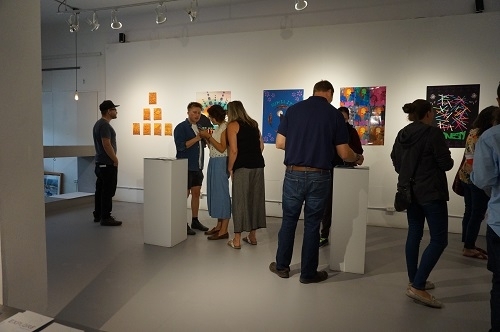 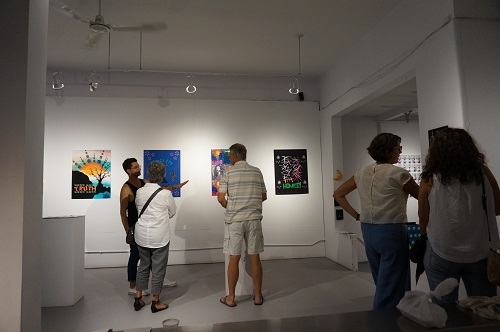 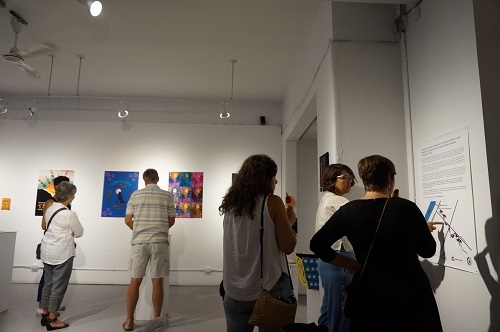 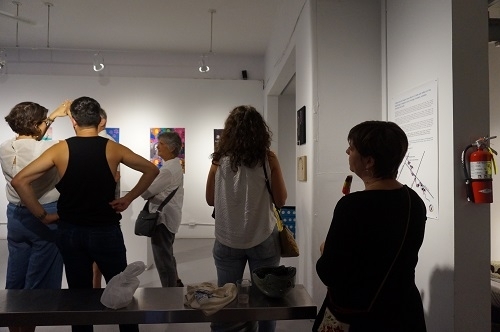 Gallery: Preview at the Edge Gallery, August 2018.